In 2009, the D.C. Council unanimously voted in favor of Bill 18-150, which imposes a 5-cent tax on disposable bags and establishes a fund dedicated to cleaning up the Anacostia River. The bill, also known as the Anacostia River Clean-Up and Protection Act of 2009, was approved by Mayor Fenty’s office and later Congress. The bill requires that grocery stores, pharmacies, and food service providers impose a 5-cent fee on both paper and plastic bags starting January 2010. Businesses will keep one cent of fee to cover administrative expenses and the remaining 4 cents will be committed to a fund dedicated to cleaning up the Anacostia River. If businesses give a discount of five cents or more to consumers who bring their own bag, the city will provide the retailer with an additional penny for each bag. The legislation was sponsored by council members Tommy Wells (D-Ward 6) and Mary M. Cheh (D-Ward 3) to discourage disposable bag use and promote purchases of reusable totes. Opponents of the bill include local businesses, the plastics industry, and the D.C. Republican party. Critics argue that the legislation, while well-intended, is not well thought out, and is a regressive tax that will most adversely affect those who can least afford it. According to the bill, the state will use collected funds in the following order of priority: launching a public education campaign, providing reusable carryout bags to residents (with priority given to seniors and low-income households), purchasing and installing equipment to minimize trash pollution, creating youth-oriented educational campaigns, monitoring pollution, preserving water quality, promoting conservation programs, restoring wetlands and green infrastructure, funding community clean-ups, maintaining a public web site, and paying for the administration of the program. A government-funded report called the Anacostia River Trash Reduction Plan revealed that plastic bags played a significant role in polluting the river, but was a minor problem on land. According to the report, plastic bags represented 20% of the litter composition in the river and 47% in nearby streams. On land, plastic bags accounted for less than 5% of the litter composition. On the other hand, paper bags were found to be common on land, but were seldom found in stream channels. The district had proposed a five year schedule to reduce trash in the area through supposed litter reduction programs and wetlands reconstruction. Total capital costs for improving the site were estimated at $13.7 million dollars with annual operation and maintenance costs of about $2.6 million a year. Trash Free Anacostia was a site created to promote the bag tax idea, generate interest in conservation programs, monitor pollution and restore the environment. However, as Mayor Adrian Fenty unveiled in his budget earlier this year, much of the revenue generated from the tax were not used to provide any new services, but rather, increase those that have already been taking place in the district for decades. As a result, the Department of Public works saved some $2.6 million by using the bag fee revenue to pay for street sweeping, as part of the mayor's effort to plug a $555 million budget deficit. Tommy Wells, a sponsor of the tax, was surpised to hear how much of the bag tax revenue went to existing public services. In a recent statement, he noted "We will take a look ... I would not expect any of the bag tax fees to go for street sweeping." Yet other lawmakers were aware of the what the bag tax revenue was planned for and argue that the tax achieved its intended result by forwarding $2.6 million of revenue for street sweeping, thereby reducing unsightly trash and cleaning up the environment. The administration estimates the remaining $1.5 million it expects to generate from the bag tax will be diverted tothe Anacosti River Cleanup Fund in the fiscal year 2011. However, city officials reported that the tax generated only $150,000 in its first month and revenues are expected to decline as people switch their behaviour. The bag tax was met with confusion in its first month, largely due to the perception that it would be applied only at grocery and liquor stores. In reality, the tax was applied to all purchases, including bookstores, clothing stores and any shop selling food or drinks. Issues of fairness and who assumes the tax burden were minor concerns, as the bag tax was said to disproportionately affect low-income households. One consumer maintained that more than anything, the bag tax was an inconvenience, especially if she misjudged the amount of reusable bags she needed to take with her and was forced to pay up or refuse a bag and carry the items individually. By September, some residents said the change was visible in the number of bags seen on the street and retailers noted a decline in the number of bags issued to consumers. Specialty retail stores that once purchased designer paper gift bags for 50 cents and plastic bags for 30 cents a piece were glad about the saving some bag expenses too. However, as more people change behavior, the fact remains that less revenue is generated for street sweeping services (and the Anacostia River Cleanup Fund) and it is uncertain whether the bag tax will generate the targeted revenue once predicted by bag tax enthusiasts. A.G. Tulou, acting director of the Department of the Environment, noted "I am somewhat surprised by the extent to which people changed their behavior... It's a bit of a double-edged sword ... The higher the revenue, that means that more bags are in circulation, which is just what we're trying to not have happen." 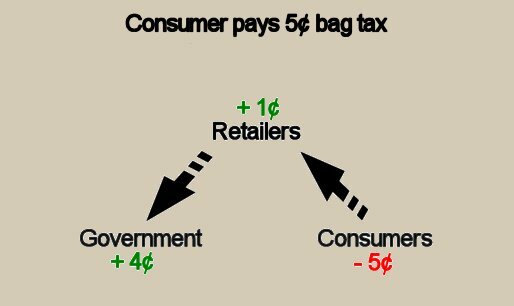 Still, critics argue that the benefits of the bag tax in D.C. is dramatized and people who mention the tax are generally those against it. Mayor Adrian Fenty, for example, estimated that out of 100 people he talked to, perhaps two brought up the bag tax in a negative light. A spokesman for Mayor Vincent Gray, who was elected in September, expressed a similar sentiment and stated that voters rarely mentioned the bag tax. Bill 18-150, also referred to as The Anacostia River Clean Up and Protection Act of 2009, bans the use of disposable non-recyclable plastic carryout bags and assesses consumers a 5 cent fee per recyclable paper and plastic carryout bag from many retailers. City Council Passed the bill unanimously. The Anacostia River is an urban tributary to the Potomac River with a serious litter problem. In an effort to reduce pollution, D.C. and Maryland contracted The District Department of the Environment (DDOE) to undertake a systematic assessment of the composition of litter found in the river. The study found that plastic bags composed 20% of the Anacostia’s litter and less than 5% of litter on land. Plastic bags composed the highest percentage of litter in surrounding streams (47%). This awareness campaign seeks to prevent former Mayor Fenty from moving the entire bag tax Fund from the Department of the Environment to the Department of Public Works, to cover existing programs such as street sweeping. The organization argues street sweeping is not a valuable service that reduces litter and it should be funded from the General Fund, not the dedicated Anacostia River Cleanup Fund for which the bag tax revenue was expected to benefit. "The D.C. Council has given final approval to a bag tax on items purchased at stores in the District. The bill will add a 5-cent fee on every paper and plastic bag shoppers use at grocery, drug, convenience and liquor stores -- as well as street vendors..."
"The D.C. Council voted unanimously yesterday to assess a 5-cent tax on paper and plastic bags to try to discourage their use, putting the District at the forefront of efforts nationwide to promote reusable shopping bags. The proposal, which must be voted on again later this month before it becomes law, is designed to limit pollution of the Anacostia River and its tributaries. The tax would apply to grocery stores, pharmacies and other food-service providers..."
To the surprise of bag tax proponents, much of the initial bag tax revenue was spent on exiting public services. Falling revenue estimates have some saying the bag tax falls short of environmental cleanup expectations. 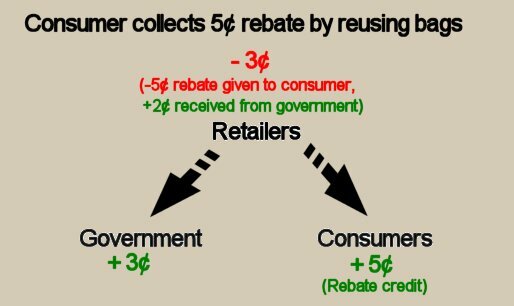 A 5-cent free on bags has gone smoothly and many note change in bag behavior as consumers bring reusuable totes and retailers issue less bags. Declining revenues are expected, but this is a positive change for reducing litter that ends in the Anacostia River.